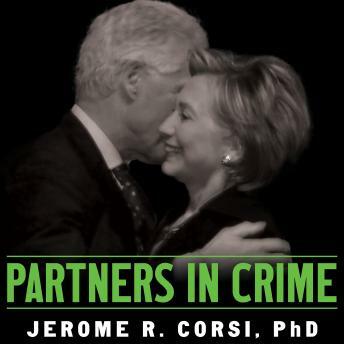 In Partners in Crime, two-time #1 New York Times bestselling author Jerome R. Corsi, PhD, presents detailed research and expert testimony proving beyond a shadow of a doubt that the Clinton Foundation is a vast, criminal conspiracy. Corsi exposes how the Clintons amassed hundreds of millions of dollars in personal net worth, while building a $2 billion empire in the Clinton Foundation. The victims are thousands of honest people who contributed their hard-earned money to what they thought were philanthropic causes. The sordid tale involves suspicion of Enron-like fraudulent accounting practices by none other than PricewaterhouseCoopers, a 'Big Four' firm, as well as the several shell corporations and pass-through bank accounts Bill Clinton has established in secret to hide what amounts to kickbacks from Clinton Foundation donors and sponsors.